Outdoor Kitchens - Legends Landscape Supply Inc.
A definite must-have for all homeowners who love to live an outdoor lifestyle. Create an impressive space for hosting your friends through the warm months, and you may find you become the object of neighbourhood envy. 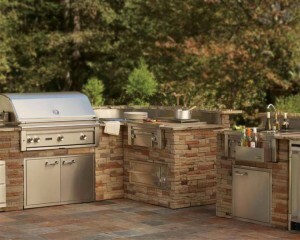 An outdoor kitchen is a must-have for all homeowners who love to live an outdoor lifestyle. You will appreciate the ease of your al fresco kitchen. So much so, that you will want to entertain all of the time! You can avoid the hot kitchen in the middle of July, and stop the struggling with the sliding doors to bring supplies outside. You won't have to prepare food indoors while your guests are conversing on your back patio. Your fridge, sink and cupboards are right where you need them- in your backyard. Stainless steel sinks, fridges, burners, and storage solutions outfit your outdoor space with the utmost functionality. All of our quality products are manufactured to stand up to Ontario's weather conditions. 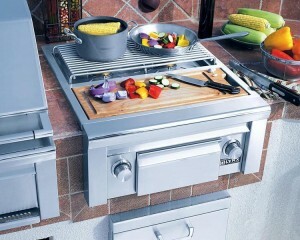 Get the highest quality stainless steel BBQs and oval ceramic grills to satisfy the most discerning grilling enthusiast. Have confidence in your purchase of these premium items with unparalleled warrantees. 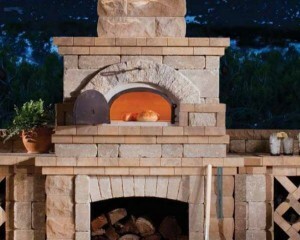 Select from a variety of different pizza oven styles, including modular and preassembled or mobile options. We are also your source for all supplies required for a custom build. 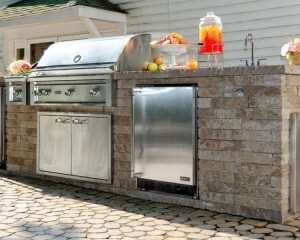 Complete your al fresco dining space with an elegant grill island kit or counter. Select the thumbnail below to learn about the different design options available to you. Stop by our showroom to view our premium products first hand. Start taking the first step to bring your outdoor kitchen dreams to life.